As much as I hate sleeping away daytime hours, a solid nap is great. I took a three hour nap yesterday and was completely re-energized. I went for a run around the neighborhood, finished some laundry, made fajitas, then went for an evening walk with the wife. It was a beautiful day all around with mild temps in the upper 70's and plenty of sun. Rain on the way for tonight, but not before we try to squeeze in one more beautiful day today with highs in the mid 70's. The cold front to our south will lift a little to the north and a low pressure system from the Plains will ride along the front bringing a chance for storms tonight. The rain will arrive around sunset tonight and the heaviest rain will be overnight. There is a slight chance for strong to severe storms, but the chances for that are slim and the Southern counties will see the best chance. The showers and storms will pull out of here through the morning hours Friday and then drying out through the day tomorrow. We could see a light spotty shower or two later Friday, Saturday, or Sunday, but the chance will be pretty small, so most of the weekend will remain dry. Temps will also be noticeably cooler for Friday and Saturday with highs in the mid-upper 60's. Back into the mid and upper 70's Sunday and on with then a better chance for rain on Monday as another system moves through drying us out for the middle of next week. Enjoy the day today before the rain arrives and have a good one! Since I was not able to go on the ride Monday night for Moped Monday, a couple of the guys who had Tuesday off work asked if I wanted to ride... Of course! It bums me out sometimes that I have to go to bed so early for work from 2:30-10:30AM, but at least I often have my day free. I LOVE riding out to Germantown Dam and that is what we have tentatively planned for our Sunday ride for our moped rally this fall. The three of us set off for Germantown yesterday. My bike was running really bad, especially on the hills. It kept bogging down and I was losing power. 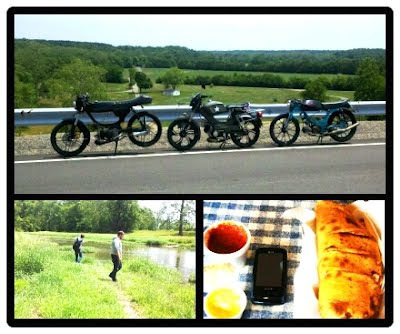 I ended up getting the bike running on flats and kept it booking into Germantown. I pulled on the throttle when we got to Captain 9's and it bogged and died...jetted too high. The bike was jetted for much cooler temperatures so the low 80's was running rich. I tossed in a lower jet in the PHBG carburetor and I was golden the rest of the day. For our Sunday ride we needed a place for a brunch. I talked to a co-worker who lives in Germantown and they recommended Captain 9's because you get a lot of food for a very reasonable price...especially the calzones. The calzone was bigger than my head practically. Very delicious food in a firefighters dream diner. There is tons of memorabilia from local fire departments. After eating, I down-jetted and we were back on the road. We rode our mopeds around the surrounding areas around Germantown. They have a lot of winding roads that are a lot of fun for a two wheeled vehicle. Most of the roads are too windy for high speeds with also caters to mopeds because traffic will not come flying pass. We spent a little time at the bottom of the dam skipping rocks and exploring a few hiking trails. On our way back home there was a Porsche that came out of nowhere from behind us on one of the roads. He had to be going at least 65 on this winding road and barely missed the three of us in a single file. Risks of the road I guess... good thing we all wear our helmets. One of the guys blew up his cylinder and piston when we were almost home. The wrist pin clip broke off at the very end and got jammed. It is such a cheap part in the motor, but I have seen this fifty cent piece ruin a lot of bikes. He said he already has a new cylinder and piston on the way, but when I picked him and the bike up (after I rode home and got my truck) I could tell he was bummed. I have been there...well not THAT bad, but it is a very depressing feeling. Other than that...a great day. Going right along with the great day...the weather. Temperatures will only top out in the upper 70's today with low humidity and plenty of sunshine after the fog burns off. Low 70's for tomorrow with rain arriving later in the day. The showers and storms will bring a decent amount of rain for late Thursday and Friday. Highs only in the upper 60's for Friday and Saturday and we still could see a lingering shower or two over the weekend, but most of us should remain dry. Temps slowly climb back up heading into next week, but not too fast. I already have the windows open to the house and look forward to the low humidity and cooler temperatures. Have a good one! After all the fun we had with Dawn's brother in town over Saturday and Sunday I needed some rest yesterday. I took a fantastic three hour nap. I often hate napping during the middle of the day, but I needed a little pick-me-up. Before our grill out for the Moped Monday I took the 73 Maxi moped frame to a friends place so we could weld up a hairline crack in the frame. It wasn't causing any major problems, but I wanted to avoid it turning into a larger crack due to the bike's vibrations. Easy breezy with the welding then we fixed the electrical on his bike. The wires behind the stator plate were rubbing the crankshaft and were shorting out. Simple fix and he instantly had spark. Love how easy mopeds are to fix. The grill out was a lot of fun and we elected a co-captain for the group to help with all the work. I needed to get home to sleep so I didn't go on their ride, but they did do a little ride by pass my house. Made me smile hearing a group of mopeds coming up the street and then see them all zipping by. I do think I am going on a ride later today with a few of the guys. Speaking of the 73 Maxi, I know what I am doing with the bike now. 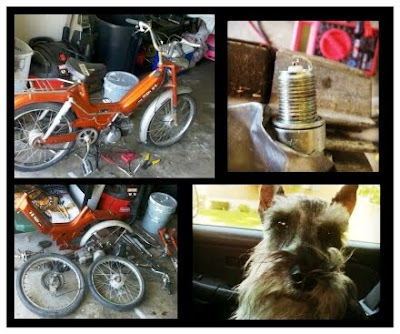 I am going to rebuild the bike...motor and all and then let my sister use it. She gets her drivers license in less than a year, but she needs a way to get to piano practice and to get around. She finishes school later this week so I am going to have her come by and help clean the bike up since it is taken apart for cleaning. If you look at the bike there is a decent amount of dirt and grease that needs cleaned up, or as Linda Green likes to call it: "scroop (scum + crud + goop)." Anyway I am having her help clean it so she will hopefully respect the bike a little more and take a little better care of it. Plus I am looking forward to spending time with my sister, since I don't get to see her very often. Take the rain gear as you are heading out the door this morning. Temperatures are very warm this morning and showers and storms are moving in from Indiana. The showers and storms will be here for the first half of the day then we dry out for the afternoon and evening. We will get into the low-mid 80's today and then cooler for the rest of the week. Mix of sun and clouds the next few days and highs in the mid-lower 70's. More rain Friday and maybe a lingering shower early Saturday with highs in the upper 60's. Hard to believe we will be that much cooler after the last three days in the 90's. So yes, we did have a heat wave: 91, 91, and then 92 yesterday for Memorial Day. We quickly warm up early next week, but I am just looking forward to opening the windows of the house for the rest of the week. Even the weekend is looking pretty nice with comfortable temps and MAYBE a shower early Saturday. Stay dry this morning and have a good one! 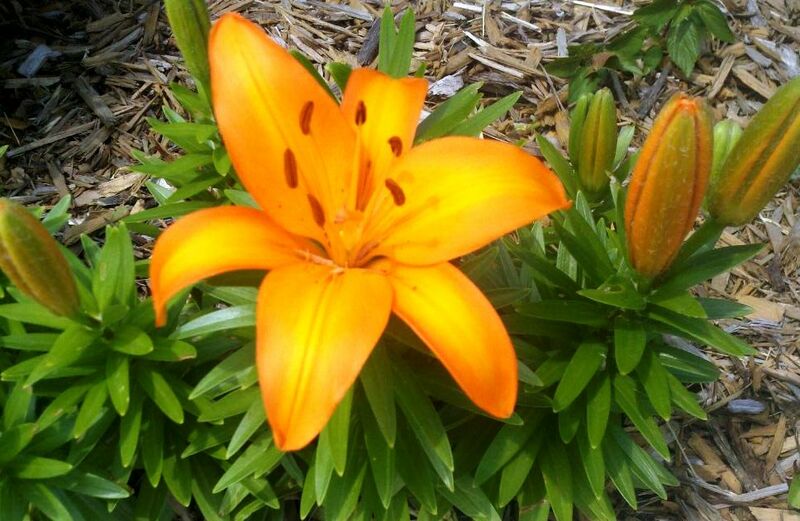 You may remember me writing about these lilies. 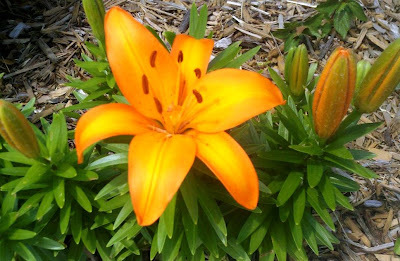 Dawn and I bought them when we lived in Sidney, but I transplanted them to Dayton when we moved two years ago. Every year they bloom on one of the first hot days of the summer, and sure enough they popped open just in time for Memorial Day and BOY was it hot! We hit 91 on Saturday and Sunday and we are expected to hit 91 again today. So I was wondering how many times we have had 90+ days in May for three or more consecutive days(heat wave). I talked with the National Weather Service office in Wilmington and for here in Dayton, here is the history of 3+ days of 90+ temps: 1895 - 3 from 29th-31st; 1896 - 3 from 9th-11th; 1900 - 3 from 15th-17th; 1911 4(two times) from 17th-20th and 26th-29th; 1914 - 5 from 25th-29th; 1962 - 5 from 16th-20th. Huge thanks to NWS ILN for digging through the records this morning to find this out. Well, as mentioned, hot today. 91 for the high and an isolated shower or storm is possible ahead of the cold front tomorrow, which will bring a better chance for rain. Low-mid 80's tomorrow then we really cool down. We dry out for the end of the week, other than Friday. 76 for the high Wednesday, then low 70's through the end of the week and next weekend. I am looking forward to opening the windows of the house again. Stay cool today and have a good one! First off... I am upset that my medications have not started to kick this illness. I woke up today and my throat was incredibly sore. I still have the hot flashes and instead of trying to fight them(cold shower or popsicle) I went outside yesterday to lay in the sun to heat up my body. Maybe it is heating up to help kill it... I dunno, but I am ready to get better...just hope I don't give this to anyone. The weekend is looking HOT! It will be the first time we will be back in the 90's since September 3rd of last year. We could see a few isolated storms later today as we warm into the mid and upper 80's. We will warm into the low 90's for the weekend with a mix of sun and clouds. A cold front will be coming through later Monday into Tuesday with a chance for storms. We will cool back to near 90 for Monday, low 80's for Tuesday with the best chance for the rain, and then mid 70's for the middle of next week. All-in-all, not a bad Memorial Day weekend and a perfect set-up for the first unofficial start to summer. Stay hydrated and have a good one! I strongly wondered if I should have taken another day off while I was heading to bed last night. It took about two hours to fall asleep and then I woke up for about two hours in the middle of the night with some weird overheating feeling. So I only got about two complete hours of sleep last night... good thing I have been sleeping/resting the last two days leading up to this morning. I am totally thinking a nap is in order again today because I need to shake this by the holiday weekend. I did stop by Kroger on my way to work to pick up some honey and lemon juice for my hot tea and cough drops for the 4.5 hours of talking. I do have a rather deep voice this morning and would be a great radio voice. Forecast is still looking warmer for the upcoming days. Today mid 80's and then upper 80's tomorrow with isolated storms possible. Then as we roll into Memorial Day weekend, low 90's and partly cloudy for Saturday and Sunday and then a chance for storms later Monday into Tuesday as temperatures fall back into the upper 80's and then mid 70's by the middle of next week. Hopefully you know of someone with a pool to cool off this weekend. When you factor the humidity in with the temperatures, the heat index will feel like the mid 90's. HOT! Have a good one! First of all... thanks to everyone who has wished me better health. This illness is a doozey. I had the sore throat since Friday and it didn't really hit me hard until Sunday. So I rested and after work on Monday I called the doctor. I NEVER call the doctor and even when I told my wife I already set up an appointment her response was "Wow, you must feel awful." I did. 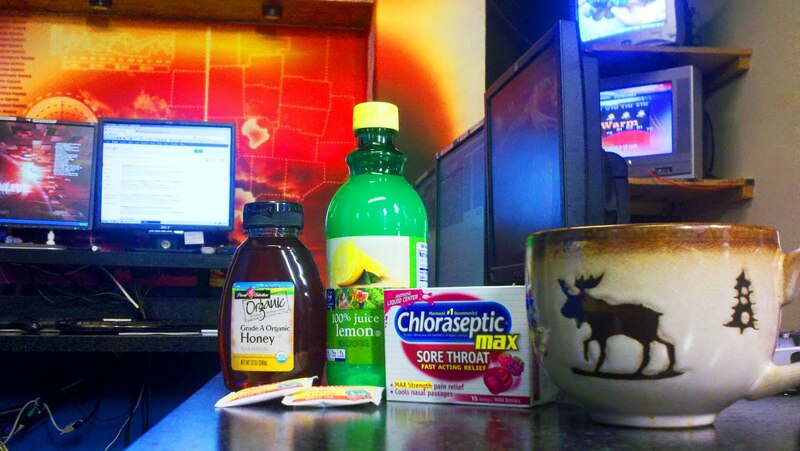 I think the 4.5 hours of the morning show really ripped apart my throat. Sorry if you find the throat picture a little gross, but you know how much I love taking pictures...haha. I have a sinus infection along with swollen glands in front of my throat so it really was putting a squeeze on my throat from both sides. I have been on antibiotics for the last two days now and also some nasal spray. I have been resting up with plenty of movies and TV shows, but I am getting antsy and want to get back to the swing of things. I thought I was recovering well yesterday, but I woke up today and my head felt like it was stuck in a vice and pounding like crazy...not to mention my throat, but at least it wasn't as sore as before. I am hoping I kick it today. Lots more sleeping, hot tea, and spending time with Buckeye. I can't tell if he is glad to have me around or would rather be left alone to rule the house alone. It seems like every time I get sick I always think about how I didn't take advantage of my good health. I am very lucky and have no big illnesses that affects me day to day. When I get sick I always think...Man, what I wouldn't give to feel 100% right now. I guess I should count my blessings. I did take a peak at the forecast models and this weekend is still looking HOT. The next few days we will be dry and climbing through the 80's and maybe an isolated shower or storm Friday. Then we really heat up with highs near 90 for the weekend and temperatures look to stay warm. Right now it doesn't look like we will be able to string three 90's together, but who knows... it wouldn't take much to get our first official heatwave. Uggghhh... I hope that isn't a sign of what is to come this summer. Back to resting....just couldn't keep myself from an update. Hopefully tomorrow it will be from the weather center at it's normal time. Have a good one! So the moped I picked up pretty cheap at the garage sale is still in my possession. There were some major issues and I did not feel proper selling it to someone else in that condition. I spent Wednesday and Thursday afternoon addressing the issues and final nailed it all down. I also finally got spark after trying to figure out the wiring. I have a few other Puch bikes, but this bike is one of the first ones that Puch shipped to America and the coil is inside the stator (vs. the later external coil) and only has three wires coming out of the engine(vs the later 6 wires). The bike is totally Euro and much different of a bike than any other stock Maxi I have seen. I figured out that the wiring is very similar to an Italian bike, just like my Motomarina Sebring that I previously owned. The lights have to work to get spark so I just grounded them from the stator and I got a beautiful blue spark. The motor needs new bearings/seals and I would feel better selling it after I replaced them. So I will be rebuilding the motor and doing a few minor adjustments to the stock bike and bump up the speed a little. Parts of the bike are covered in a thick layer of grease and dust so I took the bike completely apart for cleaning...record timing...under an hour. Buckeye also enjoyed hanging out with me in the garage with the beautiful weather. Any excuse to be outside for both of us. The great weather will continue into the weekend. Today will be mostly sunny with a high of 80. A few more clouds and a little more humid for the weekend ahead with highs of 83 Saturday and 85 Sunday. So Blessing of the Bikes at UD Arena on Sunday will have great weather... no need for the rain date. That is a HUGE event with bikers coming from all over the area and Midwest. Rain returns Monday and our temperatures cool back off into the mid-upper 70's. Maybe a lingering shower or two early Tuesday and then we dry out and warm right back into the 80's by the end of next week. The great news... this weekend looks fantastic. This weekend I had plans on going to a moped rally in Lafayette, IN, (then maybe the Blessing on Sunday for my moped) but Dawn caught a nasty illness from work so I may need to stay home to take care of her. Wife comes before everything else. Enjoy the summer-like weather this weekend and have a good one! For the first time this year grass pollen is up to the high count. So far we have only had about two days at a medium, but it is already jumping up to the high count. Tree pollen is also still at the high reading, but that should drop off as we head through the next month since most of the trees are already done budding. The good news is that with spring time allergies, like tree pollen, are very consistent, but with grass pollen, it fluctuates much more...so even a little rain will help out a lot. The forecast for the next seven days deserves one word: great! There are a few minor changes to the forecast that I think a lot of people will enjoy. Today we will have wall to wall sunshine and a high of 71. Love it! Friday a few clouds, but mostly sunny and a high of 79. Then for Saturday and Sunday...nearly identical of each other: mix of sun and clouds and a high of 83. There is a very, very slight chance for a pop-up shower, but I think most of the area staying dry all weekend. There is a better chance for rain on Monday as a cold front will bring in mid-upper 70's for temperatures for early next week. Like I said: Great! Have a good one! I have not had a day off work in over five months so my vacation time is building up and needs to be used soon. Dawn has been working diligently planning our vacation. I have offered my thoughts but I keep getting lost on where we are going. First it was Lake Michigan, then it was Erie/Niagara, and the last few days it has been Daytona Beach. 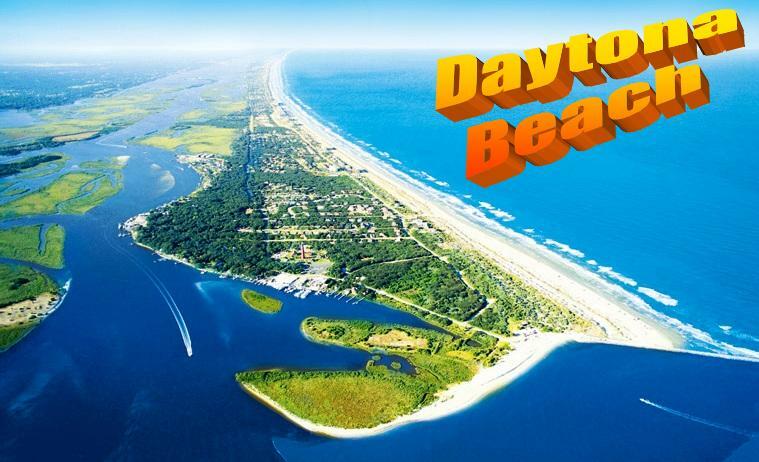 Each place has its benefits, but personally, I am all for Daytona. My family would take our vacations every other year to Florida and I always loved Daytona. It has been about five years since I have been back to Florida and I would love to go back. There are so many options and we are currently looking into a condo to rent for a week because it would be cheaper than a hotel. Either way... I am looking forward to a little R and R. I love the photo I found online...if you look REALLY careful near the middle of the photo there is a red lighthouse. I visited and climbed to the top of the lighthouse one summer when I was in middle school. Another interesting tid-bit, the Daytona race used to be held on the beach here and did a turn-around at the bottom of the island. I still have at least a couple months before vacation, but looking at the photo makes me daydream and float mentally to a warm, sunny beach. Alright...back to reality... Today will be partly cloudy here in Ohio with a very, very slight chance for a spotty shower as a weak cold front moves through around midday. Most of the Miami Valley will remain dry with highs in the low 70's for today and tomorrow. Tomorrow will be wall to wall sunshine and only a few clouds Friday as we climb back into the 80's. Low-mid 80's for the weekend so a very slight chance for pop-up afternoon shower or storm is possible. Better chance for rain early next week with another cold front moving through again. Not a bad pattern...warm, and rain only every few days. Have a good one! Watch out as you head out the door this morning if you are heading east or south of the area. Patchy dense fog is forming where the winds are light enough. The fog will lift quickly with all the sunshine today and that will also warm us up to a high near 80. Scattered showers for the Miami Valley tomorrow afternoon and a little cooler with highs in the mid-lower 70's the next couple days. 80's return for Friday, Saturday, and Sunday. With temps getting into the mid 80's for the weekend we could easily fire off a pop-up shower or storm so there is a slight chance for rain, but a better chance for rain on Monday as a cold front swings through the area. Back to the news, but just wanted to jump on quick to give you a heads up on the patchy dense fog this morning. Have a good one! This weekend turned out to be quite fun. Friday one of my college buddies visited Dawn and I and we had dinner on the patio at TJ Chumps in Miamisburg. It was fun hanging out with an old friend and catching up on how things have been since we all left our meteorology classes at Ohio State. Saturday was filled with a few more clouds. It was the high cirrus clouds so the sun was still out, but had to cut through the thin upper atmosphere clouds. Dawn and I hung out around the house in the morning and I was waiting on our morning show producer to come by so we could go play some golf. 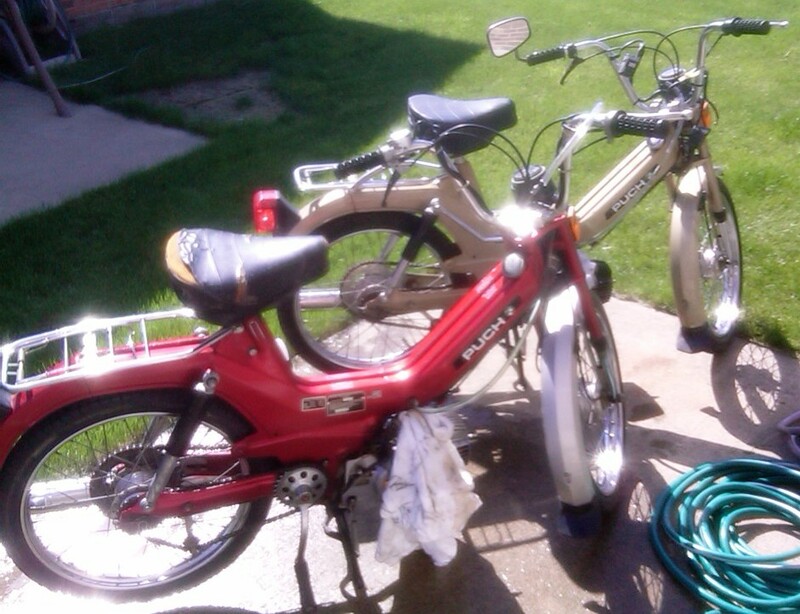 While I was killing some time I rode my moped around the community and window shopping the community garage sales...and...I spotted a Puch Maxi moped. The guy thought it was hilarious that I rode up on a Maxi as well. I talked to him for a short time and made him an offer for the bike. I didn't have enough cash on me at the time, so I left a security deposit and have to go back to pick it up. The bike needs a little TLC, but a pretty nice bike despite sitting for the last ten years. One of the local riders has been looking for a moped so I already know who this bike will be going to...not me. I rode my moped home and as soon as I was about ready to leave to play golf Dawn called and said she popped a tire. I went and put on the spare tire in record time so still made it out to Mound Golf Course. Golf went well...I parred one of the nine holes, and the rest were decent. My drive was great... 330+ yards, but my medium-short game needs work. I always over-chip my shots. Saturday night we went out to celebrate a co-workers birthday and then Sunday Dawn and I spent the entire day back on my parents farm. It was great hanging out with the family and catching up. My brothers are hilarious. Dawn thought her family was loud, but my family basically yells non-stop when we get together. A few months ago I posted a picture on here of the bedroom my sister was drawing life-size pictures of all of the Disney princesses...well she just started painting them. I will be sure to post a photo of them when she is finished, but it looks crazily awesome so far. The weather yesterday wasn't all that horrible. We dealt with showers early then most of the Miami Valley saw a little break in the afternoon followed by more light rain showers later. Today will be drier. A little light rain to the far south early then we all start to dry out and get the clouds to clear out heading into the afternoon. The only chance for rain this week will be later Wednesday as a weak cold front swings through and then either late Sunday or early next week. Temperature-wise it will be a comfortable start to the week with highs in the mid-upper 70's. We will warm up into the 80's for Friday and the upcoming weekend. It looks like a great weekend to get the boat out on the water, so get your preparations done now. Have a good one! One step forward, two steps back. When I originally got this moped it had a LOT of nasty fuel and rust in the tank. Very common for Puch mopeds. As luck would have, it was two years ago exactly that I ate the rust out. Using Klean-Strip® Phosphoric Prep & Etch the rust-removing job turns out great. 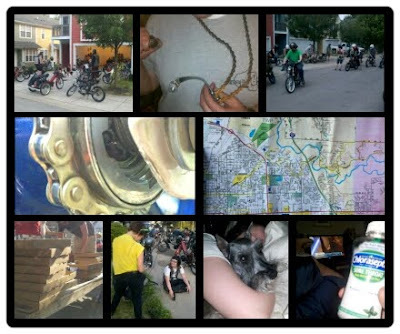 The picture with the two mopeds is from when I did it two years ago. I miss the gold bike, but the red one is currently my white bike... just completely rebuilt. I like the white look a little better. Anyway, clean out all the oil and nastiness from the tank, let the acid sit in there for 10 minutes, empty back into container, check, refill gas tank with the acid again, repeat until tank looks nice and clean. Be sure not let the acid eat through the good metal, especially since the frame is the gas tank. Once all is said and done the grey metal is a welcome sight after that nasty orange rust. PLUS, the acid can be saved and used for later. My two steps back was that when I rebuilt the bike over the winter I wanted to REALLY clean out the tank. I used nuts inside and shook it up to break free any debris. Well, I didn't rinse with a baking soda solution so the vinegar (weak acid) allowed for flash rust to the tank... I did clear out the rust flakes, but had to clean the tank again, properly. It never ends. Anyway I did the tank properly yesterday and should be in the best condition it has ever been since about 1980 when it was brand new. Some ask why I don't coat the inside of the tank, but if I ever wanted to remove that, well, I would be better off running for President. I would rather run straight metal. I was going to down gear to 14 x 40 yesterday too to help climb hills, but I never got around to it because someone came over and we tried fixing his new Tomos moped... well, "new" being that it is a 1980's Tomos. Weather for the week ahead looks GREAT. The only chance for rain is later Sunday into the early morning hours Monday possibly. Highs will be in the 70's for the next 7 days... what more is there to say? Not much, 70's and dry other than late Sunday into early Monday. That is the entire forecast in once sentence... and they expect me to talk about that for 3 minutes on-air...haha. That is when I get to add a little flavor to the forecast. It is a little chilly this morning, but with wall to wall sunshine today we will bounce into the 70's easily. Happy early Mother's Day and have a good one! The reason: you will not want to stop enjoying the beautiful weather. So drink that extra large coffee this morning so you have plenty of energy for the day ahead. Yesterday the forecast was right on the money with spotty light rain showers for the late afternoon and early evening. Today will be the start of a beautiful stretch of weather ahead. Plenty of sunshine the next few days and temperatures very comfortable with highs in the mid 60's today and then low-mid 70's for Friday and Saturday. The only wet weather for the seven day forecast is on Sunday, Mother's Day. It will be great for mothers to sleep in, and we are spending the day with our mothers inside right?! So scattered showers/storms on Mother's Day isn't THAT bad, if you put the right spin on it. Early next week will be a lot like the next few days with a few more clouds. I mentioned rain sticking around for Monday and Tuesday in yesterday's entry, but the rain looks to move just far enough south to stay out of our hair, but we will see a few clouds from the rain in Kentucky. I will keep a close eye on the models over the next few days, but right now the rain looks to stay a little further south. Basically great weather for the entire seven day forecast, other than a little rain on Sunday... so get out there and enjoy it! Have a good one! The rain yesterday was perfect timing for my shift. By the time I got out of work at 10:30 in the morning the skies were already starting to clear up. I knew one of my friends, Kevin, normally has Tuesdays off of work so I hit him up and we went for a nice 25 mile moped ride out to the Germantown Dam and back. We tried to get a picture on top of the dam because there were no cars, but the police showed up almost as soon as we killed our bikes and told us that there is no stopping up there so we resorted to the bottom of the dam. The water was up a lot but not high enough that the dam was holding any of it back. Today will be about as nice as yesterday with a slight chance for a few spotty showers later. There is another weak cold front swinging through later so a stray shower or two is possible, but most of the area will be staying dry other the slight chance for rain late afternoon. The best chance will be the Northern Miami Valley between about 3PM and 6PM. Plenty of sunshine to finish off the workweek and start of the weekend...then rain returns Sunday. The next few overnight lows will be in the 40's to keep the jacket handy. Temperatures still look to only top out in the mid 60's today and tomorrow, but back into the low 70's heading into the weekend. So it looks like several GREAT days ahead! Dawn wanted to go to the driving range and hitting a few buckets of golf balls and I think that is a GREAT idea to go along with the great weather. Have a good one! The cold front is moving through this morning. This was the radar image grabbed a short time ago this morning and the cold front is nearly through downtown Dayton currently. The winds have been switching from the southwest to the northwest as we have went through the last couple of hours. The good news is that the rain showers are almost done. Most of the rain will be out of the Miami Valley by 8AM, with most of the area already drier by 7AM. We could see an isolated shower later tonight and tomorrow, but the chances for that are very slim. Temperatures will be a little cooler for the days to come. We hit 83 yesterday before the storms rolled through and today we will top out at 73. The next couple of days in the mid 60's, but then back into the low 70's for the weekend with a slight chance for rain later Sunday. All-in-all a pretty quiet, cool week after this morning. Hopefully you will enjoy the seasonal temperatures. Got to get back to the news... reports of a nasty accident on one of the highways. Stay dry this morning & have a good one. This weekend had to be the nicest weather for a weekend that we have seen all year. Friday was a little hot and humid, but after the storms rolled through late Friday it cleared out the humidity and dropped our temperature a little for the weekend. Both days were filled with sunshine and people taking advantage of the great weather. I did a little running, bowling, dancing, and topped that off with a little golf with Dawn's father and two uncles on Sunday. They are a hilarious group and I got quite the workout... abs, that is. But all good things must come to an end... today will be a lot like Friday with storms. The storms will roll in this afternoon for the Miami Valley and some of the strongest storms will not arrive until the evening and overnight. There is an additional threat with these storms and that is flash flooding. With the ground still saturated from Friday's rain the heavy rain expected with tonight's storms, it will cause quickly rapidly rising water. Flooding is the number one weather related killer in the U.S. so take it serious and turn around if you see water over the road. "Turn around, don't drown." The storms will also likely contain strong winds, hail, and even an isolated tornado is possible with a little bit of rotation as you go up in the atmosphere. The storms look to arrive around noon and these storms will not be as severe or strong as the storms expected into the evening and around midnight as the cold front plows through. Expect to be woken up a time or two tonight and be prepared to take cover. Once the storms leave overnight we could see an isolated rain shower or two early tomorrow or Wednesday, but most of the area will start to dry out and cool off for the rest of the week. We will warm up to 81 today, 70 tomorrow, and then mid-upper 60's for the rest of the week and then low 70's next weekend. Rain will be moving back in later next weekend, but for the most part a great finish to the week. Looking forward to some beautiful, sunny, cool days. Stay dry, alert, & have a good one! Keeping in track with nearly every Friday this spring... more strong to severe weather expected to finish off the workweek. I think through the last two months there has only been two or three weeks where Friday turned out quiet for the Ohio Valley. The good news for us is that most of the severe weather will be staying to our west in Indiana and Illinois later today. Our main threat for the Miami Valley will be strong winds and hail. The atmosphere will not have a lot of rotation for the threat for tornadic storms...that is more likely west as well. Yesterday's temperature was a bit of a let-down. If I normally nail the high within three degrees I am happy and yesterday I was calling for 87, but we only got to 85. Our temperature at noon was 80 so I thought that 87 would be easily reached, but sadly, no. So it turned out to be the second hottest day of the year so far and our 244 day streak of not being warmer than 86 continues. It sure did feel warmer though. I noticed one of my tires on my truck slowly losing air and while I was trying to fill it up yesterday I noticed a nail in the tire. Dawn and I heard a loud pop Wednesday night when we went out to dinner, but I figured it was a pop can or bottle. I pulled out the nail and used a tarred rubber strip to seal it back up... almost as good as new. I checked it this morning and no air leaks. Just hope it stays that way. This morning will be warm with current temps at 4:30AM in the mid 60's. A high of 80 today as the storms move in around the evening commute. The storms will last into the evening and the main threat for wet weather for early Saturday will be the Southern Miami Valley. We will start to dry out heading into Saturday afternoon and set up for a pretty nice finish to the weekend with highs near 80. Still tracking more rain by Monday which will drop our highs to near 70 for the middle of next week. Keep an eye to the sky for later today and have a good one! While it goes without saying, I love my mopeds. The Dayton Area Moped Riders and I are still planning our moped rally this fall so I visited the Dayton Motorcycle Club last night for their weekly meeting to ask if we could use their property for our moped rally. While my moped did get a few smirks at first, I was surprised how many of the club members came up and told me about mopeds that they currently own. The inside of their clubhouse is filled with TONS of history. Behind their bar area they have a blown up photo of some of the earliest members. If I remember correctly the photo was from 1912, maybe a year or two later than that. Some of the other photos of their rallies and events were from the early to mid 1900's. I loved looking at the older bikes because they are much closer to a moped than current-day motorcycles. The good news is that they approved us to use their grounds for our rally, almost unanimously. One member voted no, but the other members said he is only kidding because he votes "no" on everything as a joke. They are a really fun bunch and the history of the club was very interesting. They also have a pretty sweet dirt track on the back side of their property. Some of the members kids were running their dirt bikes on the jumps. Awesome group and awesome location. Boy was it hot with my jean jacket yesterday. I was sweating bullets while on my moped. Temperatures today will be even warmer. I need to down-jet my bike because I was running a little rich on my fuel mixture with temperatures up into the mid 80's. I need to re-tune the bike a little leaner anyway even for cooler temps, so I have something to do today... other than clean up around the house AND take a nap since I only got about three hours of sleep. Hot today. 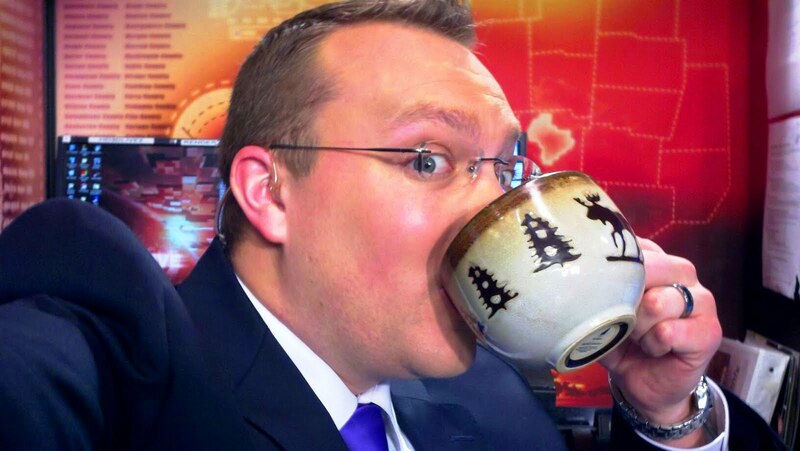 I normally use the term "hot" for 90 degrees or warmer, but after taking a vote around the station...everyone else said 85, so I guess I need to adjust my mentality a little bit. Today we will be partly cloudy with a high of 87. We have not been this warm since September 3rd, 2011.... so 244 days! With temperatures so warm we could fire up a stray shower or storm today but the chances are VERY slim. There were a few storms that popped up near Indianapolis yesterday. The roads, buildings, and city absorbs more heat and gets a little hotter than the surrounding area so that is likely why the storms fired up yesterday, where they did. We have a much better chance for storms tomorrow evening into early Saturday as a cold front pushes through. That will cool us off into the upper 70's for highs this weekend after a high of 81 tomorrow. More rain early next week will cool us off into the lower 70's for the middle of next week. So stay cool today and tomorrow, and have a good one! The storms came strong and fierce and they left the same way. The timing of the system was right on cue with what I posted yesterday morning..near or just after the evening commute. Butler County had a Tornado Warning issued at 5:30 and the tornado warnings continued as that storm moved the east through Warren and Clinton Counties until all the warnings wrapped up at 7:00PM. There were several reports of a funnel and only one house just to the northwest of Lebanon sustained minor damage. Belongings were thrown around the property and one of the walls to the house was dislodged and the structure is no longer safe for anyone to enter the home. The National Weather Service office out of Wilmington will survey the damage later today to confirm the possible tornado or rule it as straight line winds. Most of the storms that had severe hail was around 1" in diameter for the large storms, but one report from Darke County had hail reported to be golf ball size, which is 1.75". Luckily all damage from the storms was minor and no injuries to report for the Miami Valley. As of 5AM, the storms are already pushing east of Columbus so we will be remaining dry for the rest of the morning... well, a little damp still from the storms. This afternoon and tomorrow afternoon we can't rule out the slight chance for a spotty shower, but most of us will be remaining dry. Dry, but WARM. We are expected to get to 84 today and 86 for the high tomorrow. Add in the moisture and humidity from the storms and strong Southwesterly winds... it will feel closer to 90 with the HEAT INDEX. First time this year we have talked about the heat index. More storms arrive Friday into early Saturday and that will cool us back into the 70's for the weekend and a little drier and less humid. Temps will stay in the mid-lower 70's for early next week as well, so if you like the heat... get out there the next few days. Stay cool and have a good one! The wet weather will continue. Last night we had a line of storms roll through that caused some minor wind damage to the Mercer and Auglaize counties. There were reports of a barn suffering damage, power lines down, and a few large limbs also knocked down. All associated with straight line winds as the storms rolled in. The storms are out of here for this morning, but more storms expected later today. The image with this blog is from a forecast model, the WRF, from 10PM tonight. While the entire area has a chance to see rain, the best chance for severe storms, which is still only a slight chance, will be the Southern Miami Valley. They will have more energy for the storms to work with and use to strengthen. We reached 80 yesterday and only 78 today as cooler air moves in just for this morning. By tomorrow the system tries to leave, but we could still have a spotty shower or storm as we get into the lower 80's. Mid 80's and partly cloudy Thursday then more rain returns heading into the end of the week. Storms roll back in for Friday and Saturday and then cooler weather by early next week. Stay dry, cool, and have a good one!